Hi Jeff, just found your blog and love it! Been considering purchasing an Agilent scope like yours and have spent days scouring the manual and the web for info. But there are a couple things (key decision-making factors) that I can’t get enough info to confirm; I was wondering if you could shed some light since you actually have one. (A) Will it keep the previous settings? If I save a waveform (selecting, say, PNG format, external/USB storage, and the location I want to save to), power OFF the scope, Unplug it (as I turn off my whole bench at night), and then power up in the morning, when I power up and push Save to store my next waveform, will I have to select all those options again or will it have remembered? (B) Must you type in a filename every time, or will it auto-serial-number them? 2. PC-based software. (I gather you have a Mac, but thought I’d ask in case.) All mfrs have PC software these days. Rigol’s looks good/useable, LeCroy’s looks cheesy, but Tek’s OpenChoice looks Simple, Intuitive, & Effective! OTOH, Agilent proclaims Intuilink to be the best thing since sliced bread (in their datasheet), but doesn’t say beans about it’s capabilities with a scope. It seems Intuilink is more for GPIB control and use with VISA-like progs such as stuff from NI etc, not necessarily *simple* screen or dataset capture. (But it looks like they have a separate version, Intuilink Capture, for that??) It appears that it does have the MS Word/Excel toolbar/plugin, but all I really want to know is this: Using only USB, does the software allow you to click the mouse and then save the file to disk or not?!? If you find time to experiment, I and any other prospective buyers would be grateful! Regarding the save feature, I am not 100% sure about the behavior on power on, but I do know that there is some amount of automatic serialization of the filenames (ie. Newfile1 Newfile, etc.). I don’t know how flexible the serial algorithm is, I usually use Newfilex (the default) and rename them later on my desktop computer. I can check into this more (and the saving of states) and get back to you. You suspicions about the software are correct, unfortunately. The PC-software that I have seen for the scope is not great. I haven’t seen a good virtual front panel interface, and I had trouble getting the Excel macros working. So no, to my knowledge there are no good, simple programs for working with the scope from a PC (and none for Linux/Mac that I am aware of). Agilent’s drivers are targetted more towards people who want to do GPIB control, which is exactly what you pointed out. If you were local I’d be more than happy to let you play with the scope for a bit, but I’m guessing you’re not… Sometimes the local reps will let you borrow a demo unit for a few days, it would be worth a call to Agilent to ask. It’s a pretty low margin instrument for them, so it might take some persuasion… I’d call the distributors (ie. Newark) too. Thanks for the response. Don’t worry about investigating the serialization for me; what you provided answers my question good enough. I was simply concerned that the manual indicates the user must waste time creating a name when he could move on and capture more waveforms! Yeah, I’m 1800 miles away. I know there are demo programs via dealers but I don’t think I’ll bug them about it though. I’m pretty set on getting the Agilent, even if the filesave is finicky and even if there is no PC software. I’m cringing as I type that, but the other benefits outweigh. In reality, I will be overjoyed just to own a DSO that can save to flashdrive; I wouldn’t know any better, save that I became spoiled by the scope I used when I did my graduate research. The Agilent is just a rebadged and slightly modified Rigol 1000B series. Designed and made by Rigol (that’s not a bad thing). Not sure if Agilent do their own tweaks to the firmware though, or get Rigol to do it for them. 4 channels can be really handy sometimes. Nice scope for the money, enjoy! Lecroy WaveAce – The series starts just under $1k. No 4 channel options but otherwise the features are competitive. The cheapest models are only 500MS/s. Rigol DS1052E – Only 50MHz bandwidth but you can find them for around $500. There’s a glowing video review of this scope here: http://www.alternatezone.com/eevblog/?p=6. Probably the best “cheap” scope out there. At the end of the day I decided to spend the extra cash for the Agilent. My advice would be not to spend full list price for any scope right now – all the manufacturers are offering discounts. And even if the manufacturer isn’t, their distributors probably are. sweeet! 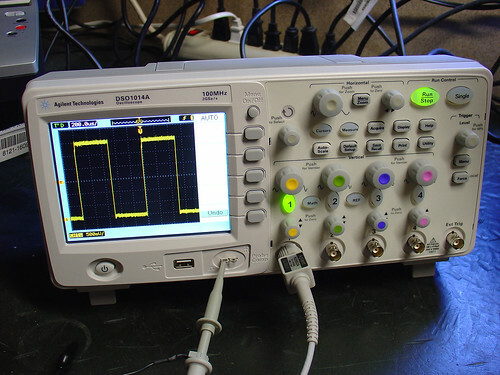 It is tempting, but I’ll probably get a Rigol 2-channel 50MHz, as I don’t have really usage for the 4 channels..
Now I am the one with Oscilloscope envy. I guess I better start saving my pennies, that is not an inexpensive machine. Actually, I think I am better off with cheap USB scope, I would not even know what to do with this one.